Energynautics is a power system analysis, engineering and consulting firm based in Darmstadt, Germany. The main focus of company activities is the integration of renewable energies into electrical power systems, especially wind power and solar photovoltaics. Since 2000, the team has been providing world-wide services considering power systems of all sizes, ranging from small islands to large interconnected systems. 1The Republic of Seychelles, an island state in the Indian Ocean, has targets to reach 5% coverage of its electrical demand with renewable energy (RE) sources by 2020 and 15% coverage by 2030. In 2014, Energynautics GmbH was commissioned by the Public Utilities Corporation (PUC) of Seychelles, financed by the World Bank, to examine whether the Seychelles grid could absorb so much renewable generation and to develop a Grid Code for the connection of distributed generation units to the power system. In addition our project partners Meister Consultants Group, Inc., prepared draft Feed-In Tariffs and Power Purchase Agreements for the Seychelles. In this paper we present the results of the Grid Absorption Study (Ackermann et al., 2014). 2The Seychelles consists of over 115 islands in the Indian Ocean off the east coast of Africa. The main island of Mahé, on which the capital Victoria is also located, has a population of around 80,000, a peak load of 50 MW and an area of 155 km2. The next-most-populated islands Praslin and La Digue are only 44 km away from Mahé and connected to each other by undersea cables. 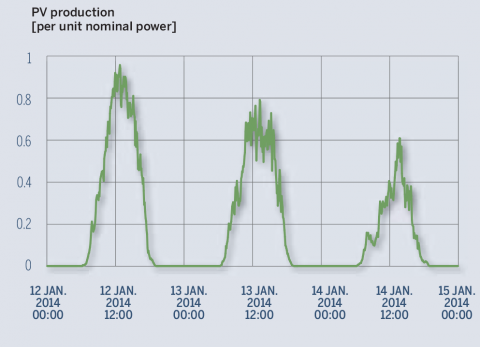 The combined Praslin and La Digue system has a peak load of just over 7 MW and a population of 8,500. The remaining islands are only sparsely-populated. The interplay between size, weather and the characteristics of the power system makes each island system unique when considering the integration of renewables. In this paper we mostly focus on the main island of Mahé. 3In 2013, eight wind turbines were installed in the harbour of the capital Victoria with a combined nominal power of 6 MW, which is enough to cover 2% of Mahé’s annual load. Apart from a few dozen photovoltaic (PV) installations, the rest of Seychelles’ generation is provided by diesel generators running predominantly on heavy fuel oil (HFO). 4The Grid Absorption Study focussed on two years: 2020 and 2030. Capacities for wind, biomass, hydroelectricity and waste-to-energy were agreed in advance with PUC and the Seychelles Energy Commission (SEC), based on potentials limited by, for example, existing land use. Therefore the chief objective of the study was to determine how much solar power can be installed on the islands, since the potential PV capacity is in theory very high. 5Simulations were performed with a network model of the three main islands of Seychelles in DIgSILENT’s PowerFactory software tool to investigate voltage problems, overloading of network assets, frequency stability and the maintenance of sufficient reserves with varying amounts of PV. 6The backbone of the Seychelles power system is an 11 kV and 33 kV network on Mahé and an 11 kV network on Praslin and La Digue. Praslin and La Digue are connected via undersea cables. A complete computer simulation model of these networks (with low voltage feeders aggregated at their transformers) was made available by the network operator PUC, including dynamic models of the diesel generators on Mahé (it was not within the scope of the project to validate these models). In 2014 there were only a few 33 kV lines on Mahé, but because of undervoltage and overloading problems due to growing demand, the 33 kV network will be extended to the South of the island by 2020 (Al-Habshi Consultants Office in association with ECOM, 2013) (see Figure 1). 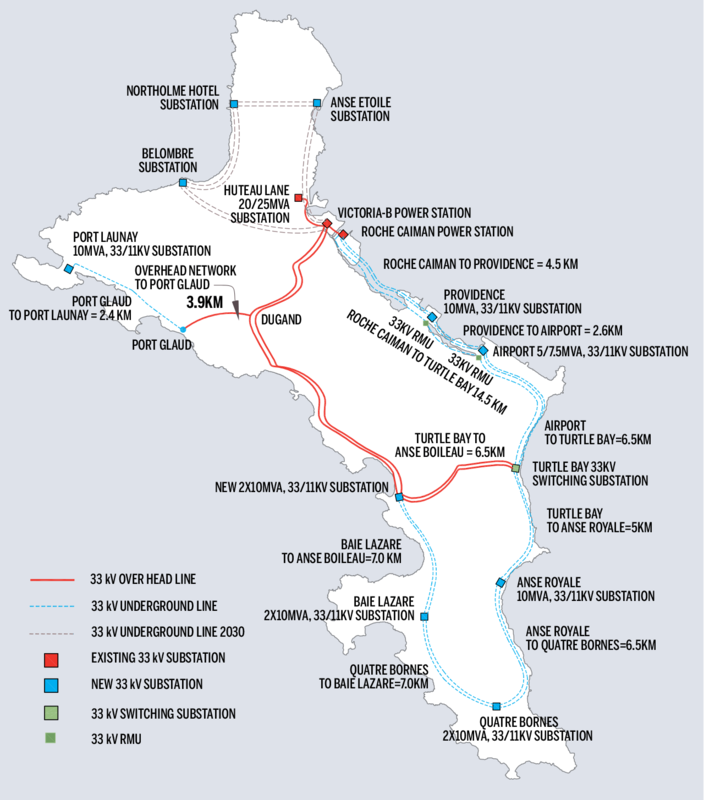 These extensions were built into the network model as well as extensions to North Mahé, which were found during the study to be necessary by 2030 due to the rising load. Typical cause for undervoltage in an electrical power system is the interplay of several factors – too little capacity reserves of lines, cables, and transformers; too high consumer load; insufficient or inappropriate reactive power provision. The consequence is a reduced quality of supply, where electrical consumer appliances do not work as expected. It also creates issues with proper detection of faults like short circuits, which cause physical danger when not cleared quickly. Overvoltage signifies too high generation infeed instead of high consumer load, together with the other factors mentioned above, and has similar kinds of consequences. While short circuits may still be properly detected, overvoltage can lead to damage to consumer equipment, and additional faults when electrical insulation is unable to withstand the higher voltage. Similarly, the interplay of several factors is responsible for overloading issues: too little capacity reserves of lines, cables, and transformers; too high consumer load or too high generation infeed. While the voltages may still be acceptable, overloading leads to inappropriate heating of the equipment. The consequences are reduced lifetime of the network equipment, leading either to increased costs for maintenance, repair, and replacement, or reduced quality of supply due to outages. In the worst case, physical danger due to overheating and resulting fire ensues. 7The load in Seychelles has two peaks: one at around midday on workdays and another in the early evening (see Figure 2). The peak demand is expected to rise by 6% a year until 2030, with additional step jumps because of large individual loads that have been waiting for their connection until the new 33 kV network is built (such as new hotel projects in the South of Mahé). The expected load development is shown in Table 1. 8The yearly demand in 2014 on Mahé was 323 GWh/a and will rise to 875 GWh/a by 2030; the minimum demand is around 52% of the peak. 9The loads consume not just active power but also reactive power, which is needed in the motors of the large number of air-conditioning units on the islands. Reactive power describes an effect related to alternating voltage and current, where the currents are higher than strictly necessary for the actual (active) power transmission. These higher currents are needed to maintain quality of supply, and must be provided by generators or other dedicated assets. The term “power factor” denotes how much reactive power a generator provides. When comparing generators, a lower power factor means a higher contribution of reactive power. The diesel generators on Seychelles currently provide reactive power with a power factor of 0.86, corresponding to the reactive power needs of the consumer load and the network infrastructure. 10On Mahé there was 71 MW of diesel capacity in 2014, with generators ranging in size from 1.2 MW to 8 MW. The newest and largest generator sets were all manufactured by Wärtsilä (Wärtsilä, 2013). The Praslin/La Digue system had a diesel capacity of just under 13 MW in 2014 consisting of units with available power ranging from 0.4 MW to 2.2 MW. To cover the rising load over the next fifteen years, it is expected that new diesel generators of sizes between 8 MW and 15 MW will be installed on Mahé and with sizes around 3 MW in the main power station on Praslin. 11The active power output of the generators is usually set between 75% and 80% of the maximum output to leave some backup capacity, which is referred to here as “spinning reserves” because the reserves are provided by generators which are online and therefore spinning. This allows enough spinning reserve to cover the loss of the biggest generator in the system and it is also the operating range in which the engines are at their most efficient. According to the Wärtsilä product guide the engines can be turned down to 50% loading level with only a 6.1% loss of fuel efficiency and can even go down to 30% for short periods, as long as they are run back up to 70% to burn off the products of incomplete combustion. The engines of MAN Diesel & Turbo have similar capabilities (MAN Diesel & Turbo, “32/40 Project Guide”). 12Backup generators which are not connected to the grid at a given time are referred to as ‘non-spinning reserves’. The generators which provide non-spinning reserves take 10 minutes to come online if they are already warmed up. This time includes various checks (of lubrication, water temperature, etc. ), visual inspection of the generating set, synchronisation to the grid frequency and loading. This means that any fast down-ramping of PV generation that happens in under 10 minutes must be covered by the spinning reserves. 13The installed capacities for wind, biomass, hydroelectricity and waste-to-energy were agreed in advance with the electric utility and regulator on Seychelles based on potentials and can be found for Mahé in Table 2. 14The exploitation of wind resources in Seychelles is limited by the mountainous granitic terrain, which makes access for large machinery difficult. The existing wind turbines were placed on artificial islands in the harbour, where access is easier but where the expected energy yield is lower. Sites in the South, better able to exploit the Monsoon winds, could be used by 2030 and reach higher annual energy yield (up to 1470 so-called full-load hours (FLHs)) according to wind speed measurements made in 2011 by Masdar and Lahmeyer (Masdar and Lahmeyer International, 2011). 15The biomass potential is based on a feasibility report (Moustache, 2011), which concludes that there is enough biomass from woody invasive species to last 15 years, after which energy crops can be planted (Knopp, 2012). The hydroelectric potential and the factor by which it can substitute conventional generation capacity come from a report on hydro potential for the Seychelles (Lambeau, 2008). The waste-to-energy plant would be located at the refuse site between Victoria and the airport. 16In 2014 there were around 400 kW of photovoltaic (PV) panels installed in Seychelles. 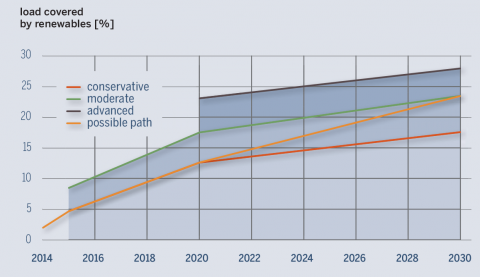 The capacities in 2015, 2020 and 2030 will be determined in Section 2 and depend on how the power system is operated. The expected annual energy yield figures for PV were provided by PUC based on measurements from existing solar panels. 17In clear sky conditions the electricity production of PV solar panels can be derived from the solar irradiation, which depends on the geometry of the Sun in relation to the Earth. However, in cloudy conditions the production can vary strongly from minute to minute as moving clouds shade the panels (see for example the production curves in Figure 3). This variability in PV production can be mitigated and smoothed by spreading PV panels over a wide area, because it is statistically unlikely that clouds suddenly cover or uncover all panels at once. 18Since the diesel generators providing the non-spinning reserves take 10 minutes to come online, any losses of PV power production that happens within 10 minutes must be replaced by the spinning reserves. Therefore it is critical for the determination of required spinning reserve to assess what the maximum down-ramp of PV within 10 minutes might be on each island. 19To assess the smoothing effects of spreading PV units across the islands one would ideally use several years worth of insolation measurements from many locations scattered around each island, with synchronised measurements made at least every minute. Unfortunately no such measurements have been made for the Seychelles, but there were power production time series available from 20 PV panels over a period of several months at time resolutions of up to one measurement per minute. 20The data from two panels from different parts of Mahé over three days are shown in Figure 3. The measurements do not seem to be synchronous, given the fact that the North Mahé profile leads the Central Mahé by around ten minutes. 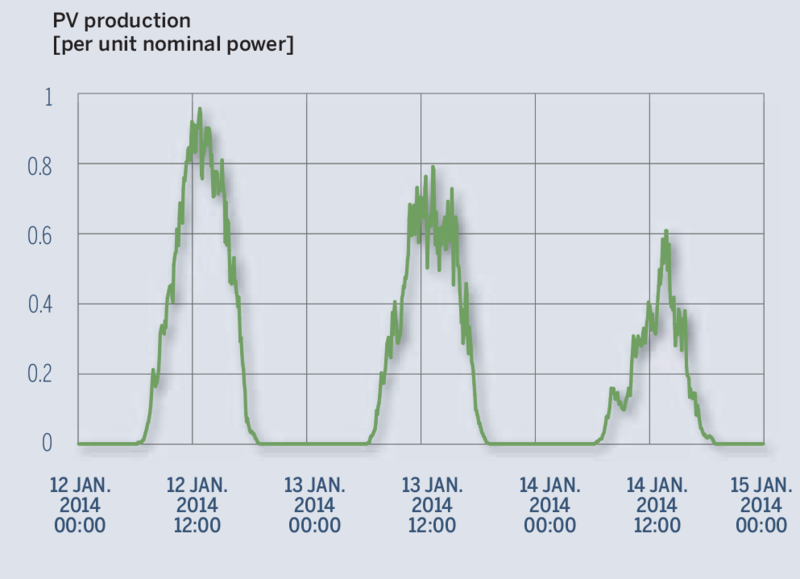 The profiles shapes differ, which is not surprising given that the PV panels are 10 km apart. There are very sudden drops in the power production due to clouds, with 80% of the nominal power of the unit being lost within 2 minutes. 21For a few weeks there were simultaneous measurement data from five panels at different sites, which have been aggregated in Figure 4 to give an impression of the smoothing effects (here we have attempted to correct for the lack of synchronisation of the time measurements). However, there were not enough measurements from sufficiently many sites of sufficient quality to make an accurate assessment of these smoothing effects. 22Because of the lack of data, a worst case assumption was made: that 80% of the nominal power of all units on each island could be lost within 10 minutes due to cloud cover. This assumption may seem severe, but it must be remembered that Mahé is small: the island is only 8 km wide, so that a cloud or weather front must only move at 48 km/h in the right direction to cover the whole island within 10 minutes. Based on wind measurements from the La Misere measurement mast, the wind regularly reaches such speeds at 72 m height, so at the height of clouds it is also likely that the wind can blow this fast. 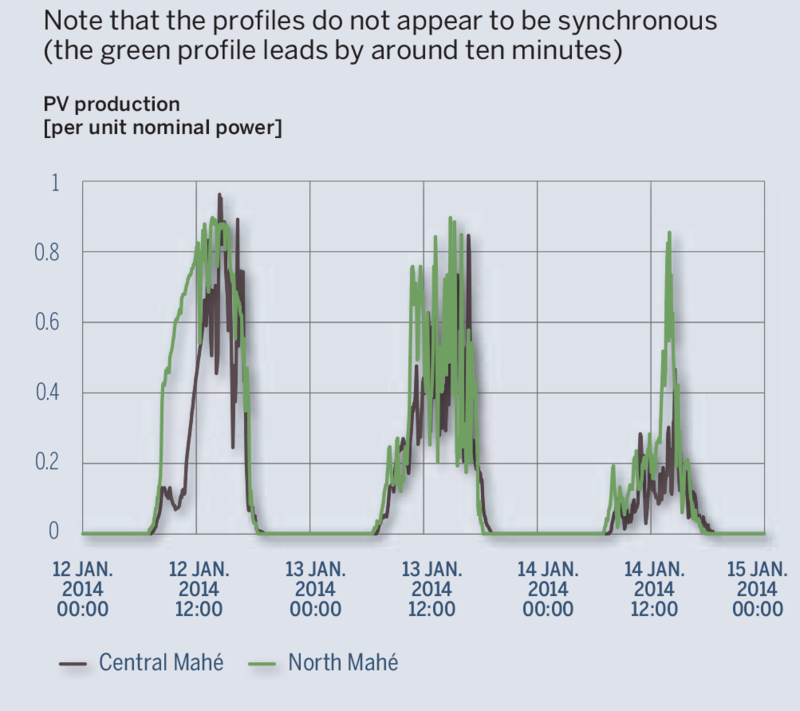 In case future measurements find that this worst case assumption is too harsh, we also performed a sensitivity analysis to show the effects of reducing the severity of this worst case to 80% loss at the capital Victoria (where much of the PV will be concentrated) and 50% loss from the rest of Mahé within 10 minutes. 23As a point of comparison, the worst PV drop within 10 minutes on the Hawaiian island of Oahu was measured at 21% of the nominal PV power of the island (Piwko et al., 2012). However at 1,545 km2, Oahu has ten times the area of Mahé and therefore the smoothing effects are much larger. If PV is predominantly installed in the low voltage network, then high PV feed-in can cause overvoltage and overloading problems on the feeder power lines, which were dimensioned in the past without distributed generation in mind. If the PV units do not provide reactive power for the reactive power needs of the load, then the diesel generators may be forced to generate at an even lower power factor than they would otherwise. Sudden changes in PV production due to fast-moving clouds can overwhelm the ability of the diesel generator governors to regulate the frequency, which may result in partial or full blackouts. If the total drop in PV production exceeds the capacity of available reserves to compensate the lost generation, then load may have to be disconnected to avoid a system blackout. 25Each of these issues is now examined for the Seychelles. 26By statute the voltage in Seychelles must be maintained within 6% of the nominal voltage in all parts of the system. Today there are already undervoltage and overloading problems in the South of Mahé due to the rising load and so the network operator is in the process of extending the 33 kV network to strengthen the grid in this part of the island (see Figure 1). The old 11 kV network in the South will then be reorganised as feeders which will attach to the new 33 kV substations. 27It was found during the study that by 2030 there would also be undervoltage and overloading problems in the North of Mahé due to the rising load (as assumed in Table 1), so the 33 kV network was extended here too. 28These network extensions are necessary to accommodate the peak load, regardless of the amount of renewables in the system, but also benefit PV integration by strengthening the network. Limiting the size of the PV inverter that converts the direct current output of the solar panels to alternating current to feed into the grid, to 80% of the maximum power output of the solar panels. This means that some of the power output of the panels is lost at times of maximum solar irradiation, but because this happens rarely, only 0.6% of the total potential yearly energy production is lost. The advantage is that the rare occasions of overvoltage and overloading are also avoided. Letting the PV units supply reactive power to meet the reactive power demand of the local consumer load, thus reducing overloading (but potentially exacerbating overvoltage problems). The chosen power factor was 0.85 (“over-excited”). Dynamically adjusting reactive power provision by PV units to maintain the voltage magnitude within allowed limits. Using measurements of the voltage from all points on the feeder to optimise the PV power output. Reinforcing the grid by installing parallel power lines, to increase grid capacity and reduce the electrical resistance of the grid, which reduces overvoltage issues. 30For each situation the worst case of low load and high PV feed-in was tested and the amount of PV was increased until either the thermal limits in some part of the feeder were exceeded or until the voltage limit was violated. An example of a residential feeder voltage profile with high PV levels is shown in Figure 5, for which lines at the start of the feeder are overloaded. It was found that the simplest strategy to increase PV penetration was to limit the inverter size to 80% of the panel size and to force the inverters to supply at power factor 0.85 (which also eases the burden on the diesel generators for reactive power provision). 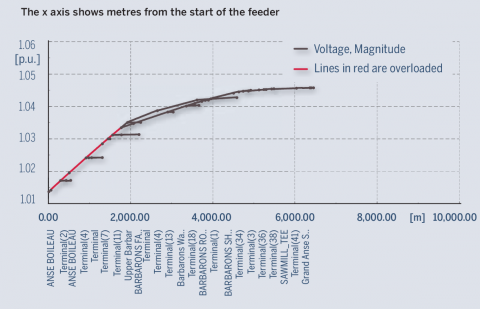 31Using this strategy, the limits for each feeder in the Seychelles system were determined for the worst case that all the PV is installed at the point of the feeders the furthest away from the substation. The sum of all feeder capacities on Mahé was found to be 119 MW in 2020 and 194 MW in 2030 (exceeding the peak demand in both cases). 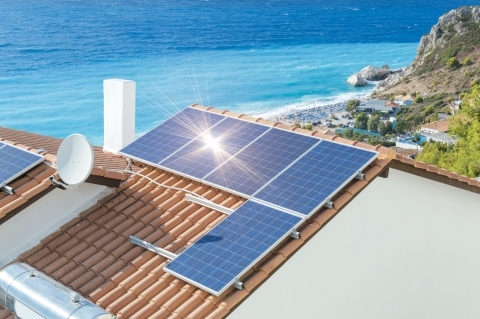 Therefore neither overvoltage nor overloading problems should limit the PV integration, as long as the PV is distributed relatively evenly around the islands and not concentrated on particular feeders. 32As explained at the end of Section 1.2, the consumer load in Seychelles requires a power factor at the diesel generators of around 0.86. There are no other assets to provide reactive power (so-called compensation assets), so the diesel generators provide all the reactive power needs of the island. 33If PV units do not produce reactive power, but only reduce the active power loading of the diesels, then the power factor required at the diesel generators becomes even smaller. This can be seen as putting an unfair burden on the diesel generators to produce reactive power. 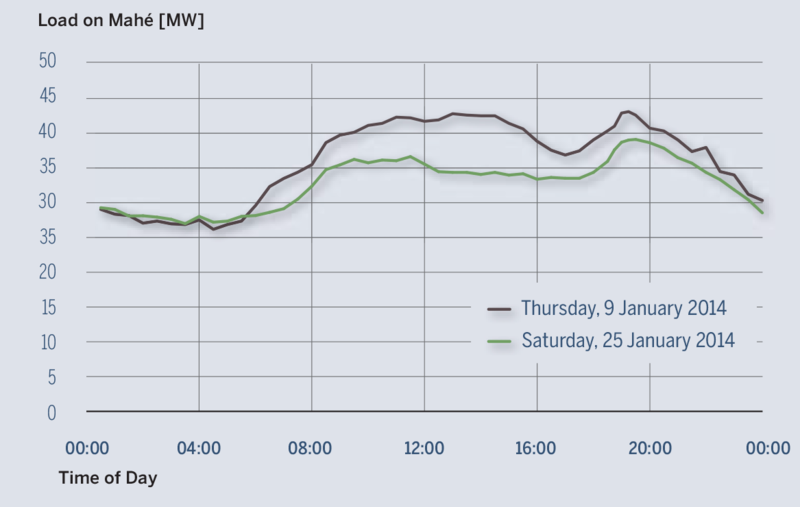 With 40 MW of PV in 2030, the power factor at the diesels dropped as low as 0.62 in simulations. To bear their share of reactive power demand, it was found necessary for the PV units to feed in with a power factor between 0.85 and 0.9 (“over-excited”). 34To avoid blackouts, the active power output of the generators must match the electrical demand exactly at all times. This power balancing is performed using the frequency of the alternating current as a signal. If electrical demand and power generation are correctly matched, then the frequency remains constant at its nominal value (50 Hz in the case of Seychelles). If electrical demand is higher than the mechanical energy fed into the generators, then the generators encounter a higher resistance and begin to spin more slowly, resulting in a lower frequency. If electrical demand is lower than the mechanical energy fed into the generators, the generators begin to accelerate, resulting in a higher frequency. The frequency does not change instantaneously because the rotating masses in the generators have inertia. The generator sets contain a control system called a governor, which monitors the grid frequency and regulates the energy fed into the generator (e.g. by changing the diesel fuel input rate) to restore the frequency when it deviates from the nominal value. If the frequency drops and the generators are unable to restore the frequency fast enough, automatic relays start disconnecting consumers to reduce the load in order to avoid a total system collapse. The first feeder is disconnected when the frequency drops below 49 Hz, so it was important in the simulations to keep the frequency above this limit during drops in PV feed-in. 35When the wind power plant was installed in Victoria Harbour, a stability study was carried out (Masdar and Lahmeyer International, 2012), for which basic dynamic models of the diesel generators, their automatic voltage regulators and their governors were prepared. These models were then used in the Grid Absorption Study to test the stability of the frequency during sudden changes of PV power production. 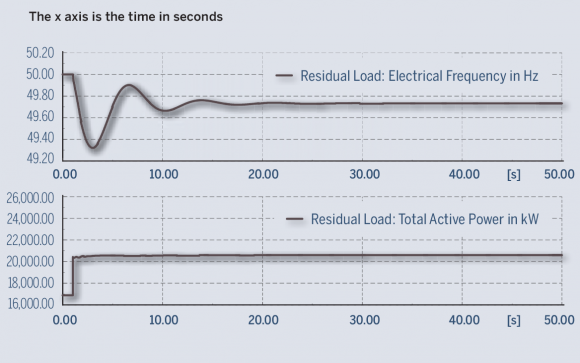 36In Figure 6 the frequency is plotted for the case in which for 2015, starting from the lowest possible residual load, 4 MW of PV generation is suddenly lost due to a fault (a single PV power plant of up to 5 MW is planned near the existing wind power plant). The frequency stays well above the threshold at which load would be disconnected. 37For longer residual load ramps (due to clouds moving over the islands) it was also found that the governors were able to act swiftly enough to keep the frequency stable. 38In providing spinning reserves to cover sudden losses of PV production, there is a tension between the minimum allowed loading level of the diesel generators and the amount of available spinning reserves. On the one hand we want as many diesel generators online as possible to provide spinning reserves; on the other hand the more PV feeds in, the lower the demand for diesel generation is and therefore the fewer generators we can have online (given the minimum loading limits). 39Energynautics wrote a computer program to determine the generator fleet configuration that provides the maximum PV integration for a given minimum allowed loading level. It was assumed that the spinning reserve would have to cover the worst case of a loss of 80% of the island’s nominal PV power within 10 minutes (the time taken to bring non-spinning reserves online). To test the sensitivity of the results to the severity of the PV loss assumption, one case was tested with 80% loss only at the capital Victoria, where much of the PV would be concentrated, and 50% elsewhere. The resulting PV integration limits are found in Table 3. 40As can be seen from Table 3, lowering the allowed minimum loading level has a big effect on the amount of PV that can be integrated, since it both increases the size of the spinning reserve and enables a lower residual load for a given diesel generator configuration. Although the diesel generators are slightly less efficient at lower loading levels (there is a 6.1% loss of fuel efficiency at 50% loading compared to 75%), they would only have to run at 50% for a few critical hours each week, when maximum PV and wind feed-in coincides with the low midday load at the weekend. Thus the increased fuel consumption due to the lower efficiency is dwarfed (by a factor of 10 when 50% is allowed) by the fuel saved due to the displacement of diesel generation by PV. It would also be important to collect data on the wear-and-tear due to more frequent generator cycling. 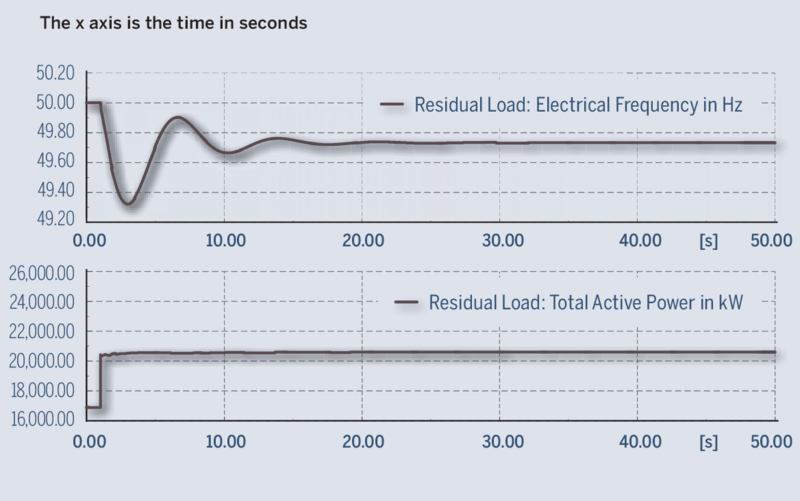 As an example, here is a short explanation of the 29 MW limit for 65% allowed loading in 2030. The calculation is based on the estimation of minimum demand during the day, which is assumed to be 90 MW (at the weekend) in 2030. The “worst case”, meaning the most difficult condition for controlling the system, occurs when as much as possible of the load is covered by wind (16 MW) and PV (amount to be determined). Only the remaining difference (residual load) is covered by the diesel generators. The spinning reserve available from the diesel generators to cover a PV production drop is proportional to the current diesel capacity and depends on their minimum operating level, 65% in this case, at which we suppose they are operating during the few critical hours. When the reserve requirement is 80% of PV rated capacity, and rated PV capacity is directly anti-proportional to current diesel production (remember the calculation of residual load), we can find at which PV capacity the reserve requirement and the available reserve capacity meet. In this case, it is 29 MW, because the reserve requirement of 0.8*29 MW = 23 MW fits with (90-16-29)*(1/0.65 – 1)=24 MW of available reserve. For a higher PV capacity, the necessary reserve capacity would be too high; for any lower PV capacity, the available reserve capacity would not be fully necessary. 41In addition to varying the minimum allowed loading level, the use of innovative technologies to increase the PV integration was also investigated. The results using a base case of 80% PV loss within 10 minutes and a minimum generator loading of 65% are given in Table 4. 42Demand-Side Management (DSM) is the time-shifting of flexible consumer loads. It can be used to delay or bring forward electrical demand so that it can better absorb renewable generation peaks and thus reduce the strain on the conventional generators. In Seychelles DSM would be possible at the canning factory of Indian Ocean Tuna in Victoria, where there are big refrigeration units with large thermal inertia, or in the water pumping and/or desalination systems. 43Electricity storage can help renewables integration in a similar way to DSM, by absorbing peak renewable generation. Pumped hydroelectricity storage plants may be feasible given the mountainous topology of the island. 44Just as for the voltage and network loading investigations, limiting inverter sizes to 80% of panel sizes is very effective, since it reduces the maximum PV drop and has only a very small effect on PV energy production over the year. Similarly restricting PV and wind feed-in to levels below their available power (“curtailment”) can be very useful during rare bottlenecks, but practical limitations mean that this would only be possible for PV plants bigger than 500 kW. 45These technology options were then combined and grouped into scenarios, based on their cost and complexity. The conservative scenario represents existing practice; in the moderate scenario the most cost-effective and easy-to-implement options are used; the advanced scenario represents the limits of what may be technically possible in Seychelles. The impact on the total renewables coverage of the load for the whole of Seychelles is plotted in Figure 7. Even in the most conservative scenario, Seychelles should have no difficulty in reaching its 15% RE target by 2030. 46In 2014 Seychelles covered just 2% of its electrical load with renewables; the rest came from generators running on expensive, imported diesel fuel. According to the Grid Absorption Study (Ackermann et al., 2014) carried out by Energynautics and described in this paper, Seychelles can reach its target of 15% load coverage by renewables by 2030 even with conservative operating practice (see Figure 7). By using innovative technologies such as demand-side management and allowing the diesel generators to operate for short periods of time at lower turn-down rates (to provide additional spinning reserves to compensate sudden losses in PV production), the Seychelles could cover up to 28% of its electrical demand from clean energy sources. As well as contributing to the reduction of CO2 emissions, the reduced fuel consumption will save money, even taking into account the costs of the renewable energy power plants. We thank the Public Utilities Corporation, the Seychelles Energy Commission, the World Bank and our project partners Meister Consultants Group for their support and collaboration during the study. Responsibility for the contents of this publication lies solely with the authors. Knopp M. (2012), “Study on maximum permissible intermittent electricity generators in an electricity supply network based on grid stability power quality criteria,” Master Thesis, Fernuniversität Hagen. Piwko R., Roose L., Orwig K., Matsuura M., Corbus D., Schueger M. (2012), “Hawaii Solar Integration Study: Solar Modelling Developments and Study Results,” 2nd International Workshop on Integration of Solar Power into Power Systems, Lisbon, Portugal. Tom Brown, Thomas Ackermann and Nis Martensen, « Solar Power Integration on the Seychelles Islands », Field Actions Science Reports, Special Issue 15 | 2016, 46-53.